We love these cookies right out of the oven! 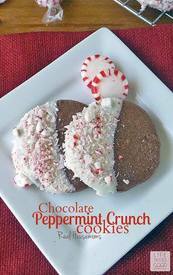 They have a rich chocolate flavor and taste great plain, but once we dip ’em in creamy white chocolate and peppermint candy, they take on that wonderful taste and feeling of the holiday season. They are so pretty too, don’t ya think? Today is National Candy Cane Day, and we use all of the left over candy canes off the tree for this recipe!